When Google engineer-turned-mindfulness expert Chade-Meng Tan gives a talk in front of a group of Silicon Valley developers and executives, he often starts with a simple exercise. It’s not the first time that Tan — who Wired recently dubbed an “Enlightenment engineer” — has seen emotional intelligence exercises transform an employee’s work and life. As Google’s resident “Jolly Good Fellow,” Tan developed Search Inside Yourself (SIY) program, a mindfulness-based emotional intelligence training program. Tan’s philosophy is that cultivating emotional intelligence through mindfulness training and meditation can help an individual reach a state of inner peace, the essential foundation of happiness, success and compassion. More than 1,000 Google employees have gone through the SIY curriculum, according to Wired, the principles of which are outlined in Tan’s New York Times bestseller, “Search Inside Yourself: The Unexpected Path To Achieving Success, Happiness (And World Peace)”. The program focuses on building up the five emotional intelligence domains of self-awareness, self-regulation, motivation, empathy and social skills, primarily through meditation and mindfulness training, which aims to improve one’s focus and attention on the present moment. The benefits of emotional intelligence in the workplace are well-documented, from career success to improved relationships to better leadership — and Tan says getting Silicon Valley interested in a meditation program to train employees in emotional intelligence wasn’t difficult. Here are four ways that you can cultivate emotional intelligence — and revolutionize your work, relationships and happiness. Tan outlines three major steps to developing emotional intelligence: Training attention (“the ability to bring the mind to a state that’s calm and clear, and to do it on demand,” he explains), self-awareness, and social intelligence. 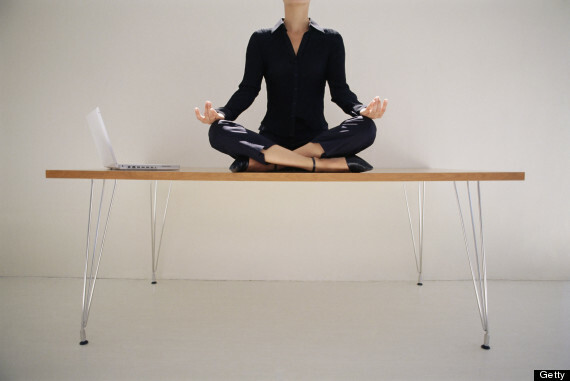 The first step is building an individual’s powers of attention through meditation. Tan is convinced that much like improving physical fitness, improving “mental fitness” through meditation and mindfulness practices can improve nearly every aspect of your life, from work to family life to physical health. Research has confimed that mindfulness contributes to emotional well-being, in addition to improving memory and attention. A 2013 University of Utah study found that individuals with mindful personality traits (such as self-awareness and attentiveness) exhibited more stable emotional patterns and reported feeling more in control of their moods and actions. Brown University research also found that mindfulness meditation could improve an individual’s control over brain processing of pain and emotions. Meditation is also the primary vehicle for cultivating compassion: A recent Harvard University study found that individuals who underwent eight weeks of meditation training were significantly more likely to help others in need than those who hadn’t gone through the meditation training. Last year, many of you helped fund my trip to Pakistan to investigate, interview, and film the devastation that the U.S.’s use of drones has caused in the region. I saw, first hand, the destruction that drones have caused, including the loss of innocent lives and dismantled families and communities. I was able to collect incredible footage and interviews because of your continued support. URGENT ACTION: A key vote in the Senate will be occurring later today or tomorrow morning. Please call your Senators at 202-224-3121 to register your opinion, and if you live in a state with two anti-gun Senators, then use the contact list below to call Senators who are on the fence. Urge your pro-gun friends and family to do the same. Thursday night last week was like a scene from the Godfather.One by one, senators shuffled into Harry Reid’s “secret room” in the Capitol, and each one (figuratively) kissed his ring and (again, figuratively) received his payment from Reid’s stack of bills. And, by the end of the night, Reid had presumably bought enough votes to pass his anti-gun immigration amnesty bill. Things haven’t changed a bit from ObamaCare. Same secret room. Same procession of supplicants. Same massive secret bill, revealed at the very same moment Reid filed his motion to cut off debate. Same morally challenged senators who were more than willing to have their votes bought. Either later today or tomorrow morning, the Senate will vote on whether to cut off all debate on the massive amendment which didn’t exist until Friday morning. There are two things to remember: The liberal (and demonstrably partisan) Congressional Budget Office looked at the long fences, copious border agents, and Orwellian E-Verify in the base bill — and decided it would have little impact on illegal immigration, reducing it by only 25%. This, in exchange for 8,000,000 new, largely anti-gun voters. If Hoeven, Corker, and Schumer claim that their “super-secret probation” amendment (fences, agents, e-verify) will have any more of an impact, let’s get a CBO estimate of that. Second, the one thing Schumer has consistently refused to do is to condition his 8,000,000 new Democratic voters on the statistically demonstrable success of border security. What does that tell you? It says this bill is more about turning this country blue than it is about securing the border. NOTE: For those of you who live in California, New York (and other states with two anti-gun Senators), you could use this opportunity to call some of the Senators on the Target List below. Apparently there are not enough chemicals already added to our drinking water, as there is now a call by “experts” to further poison our water supplies by adding Lithium. Their main reason is to decrease suicide and violent crime rates. So is this how we wish to function as a society? Instead of dealing with our issues at hand, let’s drug ourselves so that we don’t have to deal with personal subjects that may be perceived as hard, negative or scary. This is not a time for putting our heads in the sand and pretending or even hoping that an issue will just resolve itself. Where is the personal growth in that? Don’t you feel elated when you resolve a personal issue that no longer hangs over your head or weights on your mind? It is more important than ever to clear ourselves of past issues that we have held onto and allow more room for the new energies coming to earth to take its place within our being. What is Lithium usually prescribed for? So what are “experts” saying? “Lithium has been heralded by some experts as the next potential flouride, after scientists found suicide rates were lower in areas where the drinking water had higher concentrations of the element, reports the Daily Mail” . If anyone still believes that adding fluoride into our drinking water is a good idea. Please read our article on this subject here. What are some side effects of Lithium? Activists of the anti-globalist Blockupy movement scuffled with dozens of riot police who charged into a marching crowd to disperse protesters, reports RT’s Peter Oliver. The march has been reportedly stopped. 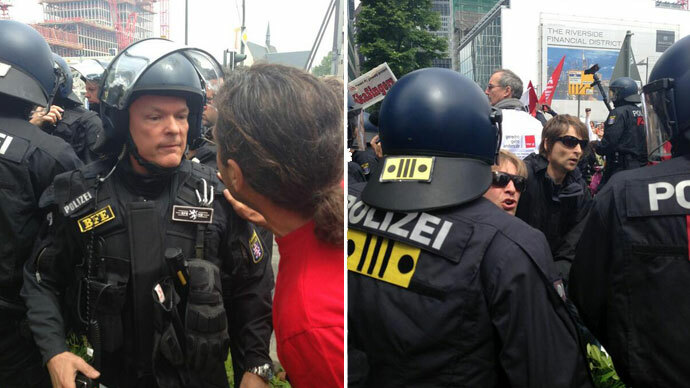 What was supposed to be a march through the middle of German’s financial capital by anti-austerity demonstrators really lasted only about 500 meters, when several hundred riot police in full kit came among the crowd. The protesters started throwing paint-filled objects at the police so puddles of paint are here and there, RT’s Peter Oliver reported. Later the paint filled bags were confiscated by police. The organizers maintain there are tens of thousands of protesters and Peter Oliver witnesses a whole column of protesters going around the ECB headquarters. The police force has split into two groups now. They do not let anybody through so the demonstration is not moving anywhere, as police and protesters are locked in a stand-off. Water cannons arrived at the scene of a peaceful protest, Oliver reports. Watch video of RT correspondent Peter Oliver live from the scene. Riot police officers have already used pepper spray several times and some people have been taken away, but it is not clear if they have been arrested. RT’s crew working at the scene has been separated by the riot police dividing demonstrators. The crew reports the use of fences and barbed wire by police. Protests in Frankfurt-am-Main started on Friday when some 3,000 ‘Blockupy’ protesters, clutching signs demanding “humanity before profit”, blocked the main entrance of the ECB, the organizers announced that the coalition has “reached its first goal” of the day. The anti-globalism march was called to celebrate the anniversary of the ‘Occupy’ rallies by blocking the European Central Bank. 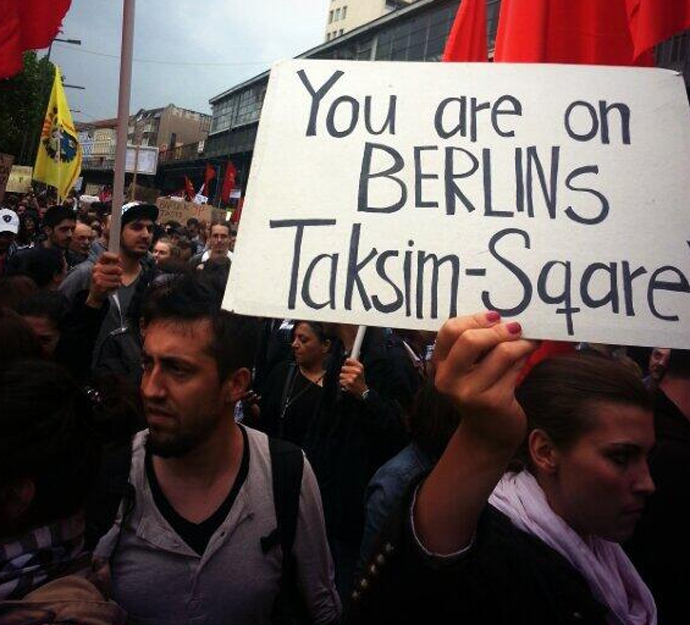 The protesters moved to city’s downtown from activists’ camp in the Frankfurt suburbs, set up earlier. Police reported that though some protesters thrown stones and there were some clashes at the barricades, about 400 people were detained on Friday. The ECB, which has headquarters at Kaiserstrasse 29, in Frankfurt-am-Main, has promised to remain operational during the planned demonstrations. 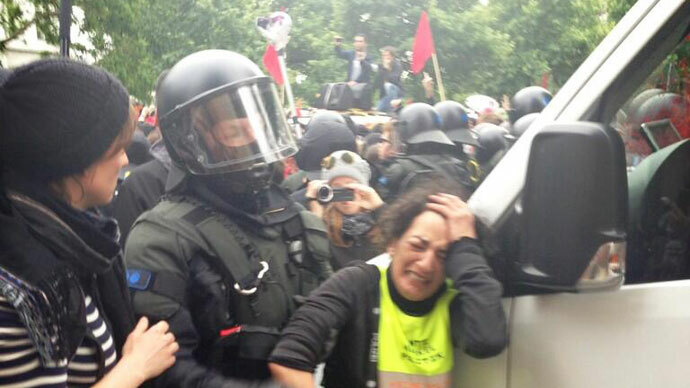 Blockupy activists lay blame for the debt crisis in Europe with the banks and in particular the ECB for its role in imposing austerity measures on EU citizens. The old saying, “You are what you eat,” poses troubling implications for public health in light of a new study on chicken meat, which found that most of it contains dangerously high levels of toxic arsenic. And the worst part is that industrial chicken producers are directly responsible for causing this, as they intentionally add arsenic-based pharmaceutical drugs to chicken feed in order to bulk them up quickly and improve the color of their meat, which in turn poisons you and your family. You can thank researchers from the Johns Hopkins Center for a Livable Future in Maryland for exposing this little-known fact in a recent paper published in the journal Environmental Health Perspectives. As it turns out, virtually all commercial chicken, including certified organic and “antibiotic-free” varieties, contain some level of inorganic arsenic. 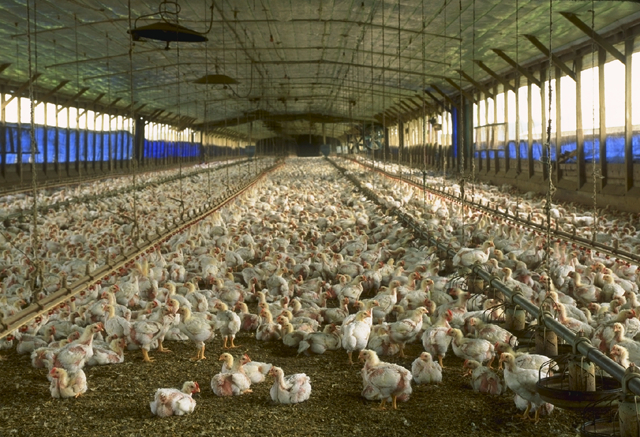 But it is the conventional chicken fed arsenic-based drugs that have the highest levels. As reported by GRACE Communications Foundation Senior Policy Advisor Chris Hunt, writing forEcocentric, Johns Hopkins researchers collected a variety of chicken samples from grocery stores in 10 cities across the U.S. Some of the meat samples came from conventional sources, while others were U.S. Department of Agriculture (USDA) certified organic or “antibiotic-free.” All the samples were tested side-by-side with each other, including in both raw and cooked form. Upon analysis, the team discovered that the conventional chicken meat samples had the highest levels of inorganic arsenic overall, containing up to four times as much arsenic as the organic chicken samples. These same conventional chicken meat samples contained up to three times more arsenic than the maximum levels proposed, but later retracted, as a safety standard by the U.S. Food and Drug Administration (FDA) back in 2011. 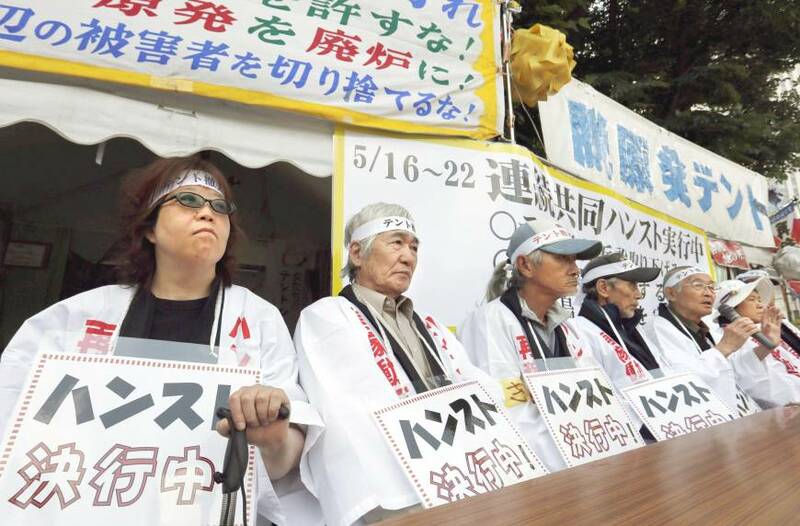 Cross Posted from JapanTimesOpponents of nuclear power started a hunger strike Thursday to press the government to drop a lawsuit demanding they remove their tents from the Ministry of Economy, Trade and Industry. They sat down in chairs in front of the tents, wearing headbands and happi coats. “People who are fighting for the end of nuclear power generation meet here and get information here,” said Setsuko Kuroda, 62, of Koriyama, Fukushima Prefecture, who frequently visits the tents.